Welcome to the MyOfficePool.ca NFL Playoffs Pool! This is our only public pool for the playoffs, open to everyone. It is FREE to enter. 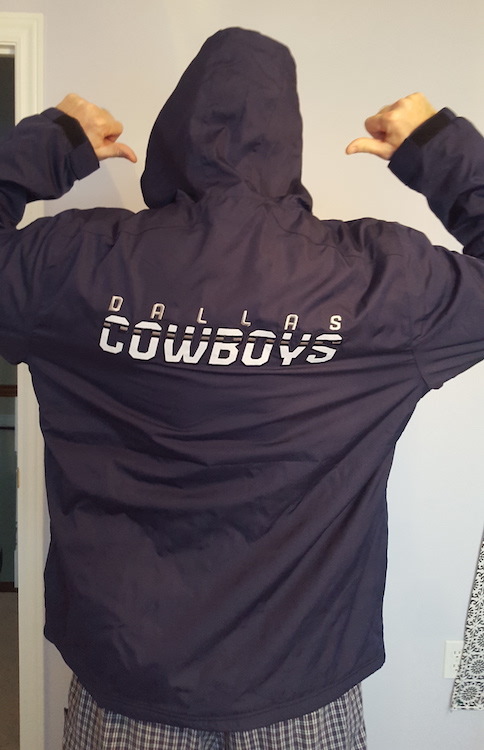 First prize is an awesome Dallas Cowboys jacket donated by member Smallmarketmen. Thanks! Pick the winner plus the margin of victory of every playoff game from Wild-Card Weekend through the Super Bowl. Deadline is kickoff of the first game Wild-Card Weekend on Saturday January 5th. The NFL Playoffs seeds are not set yet but I will adjust weekly and you can always come back up to the deadline to edit your picks. Limit 1 entry per member. If you are looking for a pay-to-play pool then you are welcome to join Mike's private pool. Mike (Feb 4): Congrats Capeislander, you won the jacket! Cowboys fan? Hope so. I will be in touch soon. Mike (Jan 29): Super Bowl Week is here! Okay, I know we are already into it, but I've been a bit behind. My annual Super Bowl Quiz will be posted soon. The_Germanator_87 (Jan 26): I hope Rams get the win and i walk away with that jacket! Thanks for setting this up, Its pretty exciting. Best part is its no margins in this final just straight up win, and your right too much brady talk happening. He does 1 OT finish and hes considered god level lol. Lets see what happens! Good luck Capeislander, May the best man win! Mike (Jan 21): This lined up nicely for an exciting finish! Pats vs. Rams Super Bowl and Capeislander vs. The_Germanator_87 for the pool! Enjoy the two weeks of "Brady is so great" media coverage. The Viking (Jan 21): Sheesh !!! Mike (Jan 16): The margin of victory points are making a difference in the pool with all of the favourites advancing, so I added the Conference Championship margins to the results page. Now you don't have to click into each person's entry to see what they've got for this weekend. Mike (Jan 13): Ha ha. For sure. I am thinking after the NHL All-Star break. And you are still doing better than me, but I have some points finally. Woo-hoo! Smallmarketmen (Jan 12): Rank 93rd..Need those hockey pools back up and running. Mike (Jan 7): Great start! The Viking (Jan 7): Looking to repeat !!! Mike (Jan 5): Only two games in and just a two-way tie for first. Mike (Jan 5): 3 hours to kickoff! Mike (Jan 4): Hmm... not being logged in should prevent the entry from being submitted. Or certainly it wouldn't know who to assign it to. Thanks for the idea though, I will look into that further. Mike (Dec 31 '18): Final seeds are set and we are now one week to the start of the NFL Playoffs! I see a few members somehow slipped in multiple entries. Twitchy clicking finger perhaps? I will remove those before the deadline so make sure your true picks are updated for entry #1. Mike (Dec 28 '18): Completely new mobile friendly look for our NFL Playoffs pools pick entry form. I did like the bracket, but no more crazy scrolling. Hope you like it! Mike (Dec 24 '18): NFL seeds are updated... and this comment board is now working (didn't realize it wasn't earlier). Lots of changes in the AFC after Week 16.